weather that is now here. 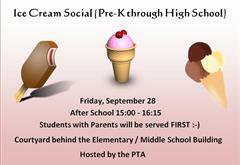 From 15:00 to 16:15, we will be serving ice-cream in the courtyard behind the elementary / middle school. All NOVA families are invited!!! Children with their parents will be served FIRST, encouraging parents to come out and make some new friends. Teachers, you are our guests at this event! Parents, we will have a donation box by the ice-cream station. Please be generous as this will help us host future events. Second, the PTA is having its first official meeting a week from Tuesday, October 9th. We will send out an agenda next week to let you know the discussion topics, but add the date to your calendars. Your children will want you to attend as the Home Room class with the best representation of parents will have a Dominoes Pizza Party the following week!